You Can’t Mess This Up. I’ve Tried. I did everything in my power to screw up this braised pork loin. Not on purpose, of course. But seriously, what was I thinking taking a work call during homework hour, a time when Abby absolutely must know immediately if 348 + 218 is indeed 9,843? And then, since it was approaching 5:00 and I wanted this pork to simmer down for at least 2 hours, I went ahead and started audibly sizzling the 2-pound slab of meat without telling the nice young man on the other end of the line, who was pre-interviewing me for this CBC report, that maybe I should call him back in 5 minutes? When Phoebe started asking me if she could fry a pineapple in cinnamon (???) as though the telephone on my ear was merely a decoration and not something that I was talking into, I headed upstairs and locked myself in my bedroom to continue the conversation in peace. Only to come down 15 minutes later to a piece of meat that was blackened on one side and completely raw on the other. And though I didn’t even remember adding onions, there they were, burnt beyond recognition. I browned the other side briefly, then reached for some wine for my braising liquid. Only a few drops were left, so instead I reached for the jar of pomegranate juice that just so happened to be sitting on the counter alongside an angry Abby, who was still seeking math approval. I poured in the juice, shut the lid, then hoped for the best. It was the best!!!! Including Phoebe’s fried pineapple, a classic accompaniment to any pork, but particularly so when that pork is as tender and flavorful as this one turned out. Even the burntness of the skin and those black onions somehow gave the dish a little extra dimension. (She says convincingly.) The lesson? Besides the fact that the sitcom-y harried mom cliche is a cliche for a reason? You cannot screw up when you are braising. In fact, when a dish so disastrous in the making turns out this delicious, it actively encourages negligence. Please, go screw this one up tonight. In a large Dutch Oven set over medium-high heat, add a few glugs of olive oil. Brown a 2-3 pound pork loin on all sides so you get a nice golden crust — about 3 minutes per side. Remove to a plate. Add one large onion (chopped), one clove garlic (minced), salt, pepper and cook until soft, about 5 minutes. Add pork back to pot, then add a dash or two of soy sauce, and any combination of red wine, pomegranate juice, and water (I did about a third/third/third) to allow liquid to come a third of the way up the loin. Bring to a boil, then cover and simmer for 2-3 hours, flipping once half way through and adding a little more liquid as you go if the level has reduced too much. The longer it simmers the better. About 10-12 minutes before you serve, add a handful or two of shredded cabbage to the pot. Remove pork and slice. Bring the braising liquid to a boil, until it is slightly thickened, about 2-3 minutes. Serve pork with braising liquid and cabbage spooned on top, and also with roast potatoes and Phoebe’s cinnamon pineapple spears. Melt a pat of butter in a skillet over medium heat. Add pineapple spears (or just pineapple chunks), sprinkle with a dash of cinnamon, and fry until slightly brown and golden. I’m thrilled to have discovered your site! I grew up eating dinner with my family every night and cherish those memories. Even though I have an insane work schedule, I refuse to not cook healthy, creative meals for my 1-year old son and husband. Look forward to trying out some of your recipes – like this one. Any idea if a slow cooker could do this one? or would all day be TOO long? Not sure, Meghan. Never owned a slow-cooker (!!) Anyone else out there know the answer to this? Uhm a little late to the party on this post, and y’all probably don’t care anymore, but a slow cooker will absolutely work here! Still brown it and the onions beforehand and then transfer everything to the cooker and let it cook down all day. Or, since it’s 2017, you probably have one of those fancy cookers that allows you to brown your meat and slow cook all in the same machine! Jenny, I now feel like a lesser home cook knowing you’ve never had a slow cooker!! Is that still true of you? Tell me I’m not a kitchen abomination! Fried pineapple was a delicacy growing up, my mom used to dredge slices of it (from a can) in flour and then fry it up in butter and oh my god was that good! Your daughter has a future in cooking, I can already tell. all day isn’t too long for braising in the slow cooker (i usually use the high setting for the first two or three hours, then switch it to low and if it gets out ahead of itself at like 4 and you’re not eating until 6, just switch it to keep warm). but brown it in the pan beforehand (just because it makes the meat tastier, i think). I ‘m always looking for new recipes for pork. This looks wonderful- a keeper! I made this last night for my in-laws, and it was delicious – I did it in the oven for 2.5 hours and at that point it was so tender, it fell apart – Thanks for the great recipe! I found your blog in 2010 and can’t wait to have a full year of it in 2011! No kids yet, but working on doing dinner with my husband as often as we can. Gave your cookbook as a gift 4 times for Christmas but forgot to keep a copy for myself (fixing that very soon)! I have one, rather embarrassingly simple, question about this recipe: what is the difference between a pork loin and a pork tenderloin, if any? Meat mystifies and intimidates me. First of all, i love your blog and your cookbook. thanks for both! second of all, i made this for christmas dinner. It was beautiful and the braising liquid and the cabbage was very, very delicious. But the pork was kind of just okay – a little too tough. It cooked on the stove for three hours – could I have cooked it too much? Is there a way to test other than cutting it in half to peek at the middle? thanks!!! and happy holidays. mielcars — oh no! No one’s xmas dinner should be described as just ‘okay.’ I don’t know what you could have done differently. Was it braising in enough liquid? was it at a slow simmer and not at a boil? There really is no such thing as overcooking when you are using this technique. In fact, the longer you let it braise, the more it should break down. That is the beauty of it. Maybe try it Andy’s way next time? Inside the oven? I’ve made this a couple times now and oh-my-goodness…the first time, my eyes rolled in the back of my head, it was so good. I may never make pork loin any other way. Absolutely delectable…and only better on the second day. Made this last night for a dinner party (didn’t try it out in advance b/c I trust you that much!) It was fantastic! I actually put two roasts in the pot b/c I have a fear of not having enough food. I didn’t add anymore of anything else (maybe an extra handful of cabbage). Everyone loved it and we have a bit leftover (not much). I have never owned a cookbook I’ve relied on as much as DALS. So after making this dish several times, i FINALLY added the Chinese 5 spice, as directed in the book (but as “optional”). holy cow!! the addition of that one spice took this dish to a whole new level of deliciousness!! and the smell? wow!! chinese 5 spice should NOT be optional!! Wow, just came across this dish and the color of the purple cabbage is so striking here! I was searching for eggplant recipes and this one popped since I seem to have the color purple on the brain atm lol! Shall have to file this one for October, a time when cooler temps mean a lovely pork loin in the oven is a welcome dinner. And I will pick up some Chinese 5 spice as recommended too. Back in search of recipes where I can use up these eggplants! Am I blind? I’ve erased this whole thing a few times and see nothing about Chinese 5 spice…? Anyhow I’m making it as we speak. Can’t wait!! Just made this in our slow cooker – delicious! One of those days when dinner started at breakfast. Didn’t have the Chinese 5 spice but will be sure to use that next time. We all arrived home late to a lovely dinner. Sauteed some apples and served with rolls. Done. I have two questions already asked above – where is the Chinese 5 spice listed and how much to use? Are pork loin and pork tenderloin the same, as Amy asked? I just made this last night for Sunday dinner, and…WOW! It was so delicious! The pork was amazingly tender and the cabbage with the onions was unbelievably delicious. We argued over who would take the leftovers for lunch because we all wanted to eat that meal again. Thank you for sharing! The Chinese 5 spice is a suggested/optional ingredient in the version of this recipe that appears in the DALS cookbook. Amount is 1 tsp. Second, pork loin and pork tenderloin are NOT the same. 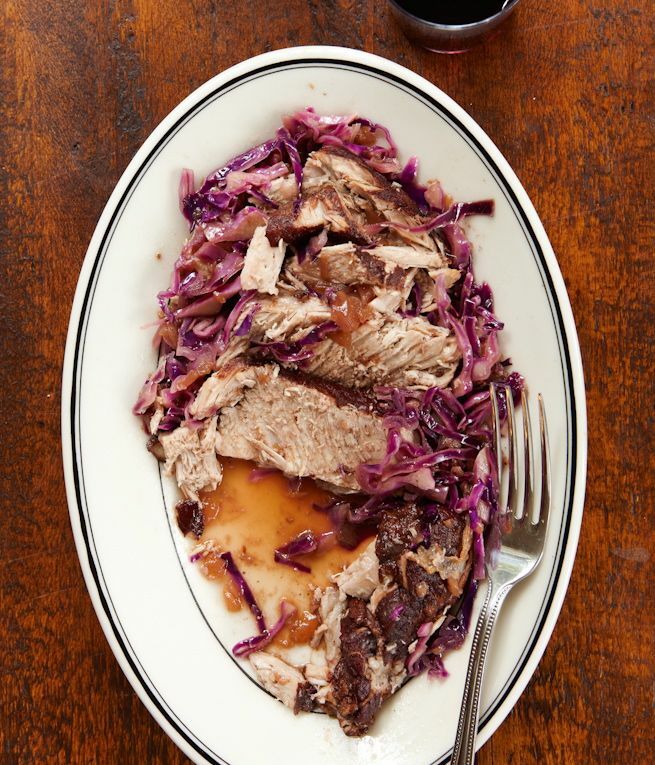 Loin is a roast cut, good for slow braising like this recipe. Still pretty lean, in the grand scheme of things. But not as lean as pork tenderloin, which is the long cylindrical cut that you often see in the grocery store in a vacuum pack, and sometimes already marinated or otherwise seasoned. Lastly, Jenny R., we made this for the first time last night, after talking about it MANY times. Instead of pomegranate juice, we used about half a bottle of pomegranate molasses. The sauce is to die for – sweet, tangy, wonderful. And our pork loin was shredable tender, which is exactly what we wanted. I have always loved this recipe-the sum is greater than its parts! Now revisiting -I am wondering how it would be with a pork shoulder? Too fatty? Longer cooking time? What do you think? Hoping someone will still be around since last comment was posted 2 years ago! Thanks! Well, I guess no one is out here anymore…anyway, I did make this with a pork shoulder. I refrigerated it overnight, took off the congealed fat, reheated and added cabbage at end. It was very flavorful and tender. But this dish will win no awards for beauty-I’d be hesitant to serve it to company, even though it’s tasty. And on following day, for leftover lunch, the red cabbage was blue!! I love this recipe-the sum is greater than its parts! Now revisiting-im wondering if this can be done with a pork shoulder? Too fatty? Longer cooking time? What do you think? Hoping someone will be around since the last comment was 2 years ago! Thanks! Now that you have a slow cooker, have you tried this recipe in it? I’m wondering if I can do this in a slow cooker with a pork tenderloin (or two)?